Sadly, this page has not been kept updated. But it does show you something of our history, so I leave it in for now. On Saturday, October 17, per our time-honored tradition, ZDRAVETS will take its monthly dance to Flora and Richard’s famous Dance Barn in Whately, MA. On Sunday, January 24, 2010 (snow date: Jan. 31), ZDRAVETS will play for dancing in West Hartford at the “Always On Sunday” dance. We are currently working out a date, probably in February or March, to play at the Framingham International Folk Dance -- watch this page for more information! 2009 On Saturday, September 26, ZDRAVETS was one of the two bands playing for dancing at the Folk Arts Center of New England’s annual Benefit Birthday Bash (Concert and Dance Party). On Tuesday, August 4, ZDRAVETS played for the Folk Arts Center’s “Folk Dancing By the Fountain” series, held outdoors in Copley Square, Boston. On Saturday, May 16, ZDRAVETS played for a birthday party in Whately, MA, at Flora and Richard’s famous Dance Barn. Friday-Sunday, April 24-26 was the New England Folk Festival in Mansfield, MA. On Saturday ZDRAVETS presented a one-hour concert, and on Sunday we played for a dance party in the Middle School Dance Hall. On Saturday, April 11, ZDRAVETS played for a one-hour dance session, including teaching, at Brown University’s Folk Festival in Providence, RI. On Saturday, March 21, ZDRAVETS played a set in the Kefana at Boston’s annual BALKAN MUSIC NIGHT, held as usual at FOPAC, 51 Walden St., Concord, MA. On Wednesday, February 25, ZDRAVETS played at the Framingham International Folk Dance. 2008 On Saturday, November 15, ZDRAVETS shared its monthly dance with KABILE, a traditional Bulgarian wedding band from Thrace. On Saturday, October 25, ZDRAVETS’s October monthly gig was held in Whately, MA, at Flora and Richard’s famous Dance Barn. On Saturday, September 27, ZDRAVETS was one of the two bands that played for dancing at the Folk Arts Center of New England’s annual Benefit Birthday Bash (Concert and Dance Party). On Tuesday, July 22, ZDRAVETS played for the Folk Arts Center’s “Folk Dancing By the Fountain” series, held outdoors in Copley Square, Boston. On Saturday, May 31, ZDRAVETS - along with three other bands (Shining Moon, The Pinewoods Band, and Pajdashi) - helped celebrate a triple birthday at a gala dance-party. Friday-Sunday, April 19-20 was the New England Folk Festival in Mansfield, MA. ZDRAVETS played for a dance party in the next-to-last hour of the festival, in the Middle School Gym. On Saturday, March 8, ZDRAVETS played a set in the Kefana at Boston’s annual BALKAN MUSIC NIGHT, held as usual at FOPAC, 51 Walden St., Concord, MA. On Wednesday, February 6 - ZDRAVETS played at the Framingham International Folk Dance. 2007 On Saturday, October 20, ZDRAVETS’s October monthly gig was held in Whately, MA, at Flora and Richard’s famous Dance Barn. On Saturday, September 29, ZDRAVETS was one of the two bands that played for dancing at the Folk Arts Center of New England’s annual Benefit Birthday Bash (Concert and Dance Party). On Sunday, April 29, ZDRAVETS played for dancing in West Hartford at the “Always On Sunday” dance. On Saturday, April 21, ZDRAVETS presented a concert and play for a dance party at the New England Folk Festival in Mansfield, MA. On Wednesday, March 21, ZDRAVETS played at the Framingham International Folk Dance, in honor of Paul Young and Charlotte Richardson’s 25th wedding anniversary. On Saturday, March 10, ZDRAVETS played at Boston’s annual BALKAN MUSIC NIGHT, held as usual at FOPAC, 51 Walden St., Concord, MA. OnSaturday, January 27, ZDRAVETS joined forces with the Cambridge Folk Orchestra to play for the Folk Arts Center of New England’s monthly dance party in Belmont, MA. 2006 Saturday, October 21, ZDRAVETS’s October monthly gig was held in Whately, MA, at Flora and Richard’s famous Dance Barn. Saturday, September 23, ZDRAVETS was one of the several bands that played for dancing at the Folk Arts Center of New England’s annual Benefit Birthday Bash (Concert and Dance Party). Tuesday, August 22, ZDRAVETS played for the Folk Arts Center’s “Folk Dancing By the Fountain” series, held outdoors in Copley Square, Boston. Saturday, June 10, ZDRAVETS hosted two special guests from Bulgaria at its regular monthly party. Kera and Aishe, two traditional singers from the town of Draginovo, sang for us during the breaks, and enjoyed an evening of dancing with us. For more about Kera and Aishe, see Specials: Draginovki. Sunday, April 23, ZDRAVETS presented a concert and played for a dance party at the New England Folk Festival in Natick, MA. Saturday, March 25, ZDRAVETS joined forces with the Cambridge Folk Orchestra to play for the Folk Arts Center of New England’s monthly dance party in Belmont, MA. Saturday, March 11, ZDRAVETS played for dancing in the Main Hall at Boston’s BALKAN MUSIC NIGHT, held as usual at FOPAC, 51 Walden St., Concord, MA. Thursday, March 9: ZDRAVETS participated in a Multicultural Night at Franklin School in Newton, MA. 2005 Thursday, November 17: ZDRAVETS presented a program at the Public Library in Providence, Rhode Island. Saturday, October 22, ZDRAVETS’s October monthly gig was held in Whately, MA, at Flora and Richard’s famous Dance Barn. Sunday, September 18, ZDRAVETS played for dancing in West Hartford at the “Always On Sunday” dance. Tuesday, July 12, ZDRAVETS played for the Folk Arts Center’s “Folk Dancing By the Fountain” series, held outdoors in Copley Square, Boston. Saturday and Sunday, April 9 & 10, ZDRAVETS presented a concert and played for a dance party at the New England Folk Festival in Natick, MA. Saturday, March 19, ZDRAVETS played in the Kefana at Boston’s BALKAN MUSIC NIGHT, held as usual at FOPAC, 51 Walden St., Concord, MA. 2004 Saturday, December 4, ZDRAVETS was one of the bands playing for “FOLK DANCING for GRACE ARTS” a benefit for the Grace Arts Project (GAP), a music and art program offering lessons and performance opportunities for students ages 7 and up. More information. Saturday, October 23, ZDRAVETS’s October monthly gig was held in Whately, MA, at Flora and Richard’s famous Dance Barn. Tuesday, July 13, ZDRAVETS was prepared to play for the Folk Arts Center’s “Folk Dancing By the Fountain” series, usually held outdoors in Copley Square, Boston. This year, rain interceded. Saturday and Sunday, April 24 & 25, ZDRAVETS presented a concert and played for a dance party at the New England Folk Festival in Natick, MA. Saturday, March 20, ZDRAVETS played in the Kefana at Boston’s BALKAN MUSIC NIGHT, held as usual at FOPAC, 51 Walden St., Concord, MA. 2003 Thursday, October 30, ZDRAVETS did a presentation of and about our music at the New England Conservatory, from 5:30-7 p.m.
Saturday, October 25: ZDRAVETS’s October monthly gig was again held in Whately, MA, at Flora and Richard’s famous Dance Barn. Saturday, October 4, ZDRAVETS was one of several bands performing at the Folk Arts Center of New England’s annual Benefit Birthday Bash (Concert and Dance Party), held at Trinity Episcopal Church in Newton Centre. Tuesday, July 8, ZDRAVETS played for the opening dance of the Folk Arts Center’s “Folk Dancing By the Fountain” series, held outdoors in Copley Square, Boston, 7:30 p.m.
Saturday and Sunday, April 26 & 27, ZDRAVETS played for a dance party (Saturday evening at 10:00) and presented a concert (Sunday afternoon from 2 to 3) at the New England Folk Festival in Natick, MA. Saturday, March 22, ZDRAVETS played in the concert portion of Boston’s BALKAN MUSIC NIGHT, held as usual at FOPAC, 51 Walden St., Concord, MA. Friday, March 7, ZDRAVETS played for the “Tuesday Night Revival” dance, held at The Church of Our Saviour, 21 Marathon Street, Arlington, MA. Sunday, March 2, ZDRAVETS played for International Folk Dancing at the MIT Folk Dance Club’s regular Sunday night dance, in the MIT Student Center. Sunday, February 16, ZDRAVETS played for dancing in West Hartford at the “Always On Sunday” dance. Saturday, January 18, 2003, ZDRAVETS wwas one of many bands playing at the Zlatne Uste Golden Festival in New York. See www.zlatneuste.org for more information. 2002 Sunday afternoon, November 10, from 3-5: ZDRAVETS played for a Family Dance at The Parish Center for the Arts in Westford, MA. Sunday, October 27: ZDRAVETS shared the closing International Dance party at the NOMAD Festival with the men’s singing group “Zornitsa”. Saturday, October 5: ZDRAVETS’s regular monthly gig was held in Whately, MA, at Flora and Richard Josephs’ famous Dance Barn, as it has been for the past several Octobers. This time we had the honor and joy of sharing the evening with the BISSEROV SISTERS from Bulgaria. Saturday, September 28: ZDRAVETS was one of several bands performing at the Folk Arts Center of New England’s annual Benefit Birthday Bash (Concert and Dance Party). Festivities were at Trinity Episcopal Church, Centre & Homer Sts., Newton, MA, from 8-11:30. From 6 to midnight on Sunday, August 17, ZDRAVETS helped Peter Steffenson celebrate his birthday at a gala dance-party at the Stevens Memorial Building in Chester, NH. Tuesday, July 16: ZDRAVETS played for the Folk Arts Center of New England’s outdoor dance in Copley Square, Boston. Sunday, June 2: ZDRAVETS members played at the “Always On Sunday” dance in West Hartford, CT, at a special memorial gathering for Bruce Batts. Saturday, June 1: ZDRAVETS was one of sevaral groups participating in a Gala Concert and Dance Party to benefit the “Pirin Sings” Foundation. Festivities took place at Trinity Episcopal Church, Centre St., Newton, MA. Friday, May 31: ZDRAVETS did a special presentation for a kindergarten and a second-grade class at Franklin School in Newton, MA. Saturday, May 4: ZDRAVETS participated in the Second Bulgarian Folklore Festival, at St. John's United Methodist Church, 80 Mt. Auburn St., Watertown MA, at 7:30 p.m. Other performers included The Roses, Veneta Georgieva, Vlada Tomova, and Yanka Roupkina. April 20 & 21: ZDRAVETS presented a concert (Saturday evening at 8:30) and played for a dance party (Sunday afternoon from 3 to 4) at the New England Folk Festival. March 16: ZDRAVETS was one of the bands in the concert portion of Boston’s BALKAN MUSIC NIGHT 2002. Sunday, January 27, 2002:, ZDRAVETS played for International Folk Dancing at the MIT Folk Dance Club’s regular Sunday night dance. 2001 October 28 (Sunday): we shared a dance party with the men’s singing group “Zornitsa” at the NOMAD Festival, from 4-5 p.m.
October 13 (Saturday): we again took our regular dance to The Dance Barn in Whately, MA. Saturday, September 22:, ZDRAVETS was one of several bands that played for dancing at the Folk Arts Center of New England’s annual Benefit Birthday Bash (Concert and Dance Party). The festivities took place at Trinity Episcopal Church, Centre & Homer Sts., Newton, MA. August 1: members of ZDRAVETS supported Kremena Stancheva in concert in Arlington, MA, and played for dancing after the concert. Such fun to have her singing along with us, and to be able to sing with her some of the songs we had learned from her! July 31: ZDRAVETS played for an enthusiastic crowd of passersby at the Folk Arts Center of New England’s outdoor dance in Copley Square, Boston. Several Bulgarians on their way home from work were startled to find Bulgarian music greeting them as they crossed the square, and stopped to chat with us. June 2: ZDRAVETS was one of sevaral groups participating in a Gala Concert and Dance Party to benefit the “Pirin Sings” Foundation and celebrate National Bulgarian Cultural Day. Festivities began at 7:30 p.m. at Trinity Episcopal Church, Centre St, Newton, MA. On April 21 & 22, ZDRAVETS presented a concert and played for a dance party at the New England Folk Festival. March 17: ZDRAVETS played for dance teaching and dancing at Boston’s BALKAN MUSIC NIGHT 2001. March 4: ZDRAVETS played for dancing in Winchester, Mass. after a concert by Valya Balkanska and a variety of local Bulgarian artists. 2000 On Friday, October 20: ZDRAVETS played for the Friday night Folk Arts Center dance. On October 14 (Saturday) , we took our regular dance to Whately, MA to fill a long-standing promise. On Saturday, September 23, ZDRAVETS was one of the several bands that played for dancing at the Folk Arts Center of New England’s annual Benefit Birthday Bash (Concert and Dance Party). The festivities took place at the West Medford Congregational Church, 400 High St., West Medford, MA. 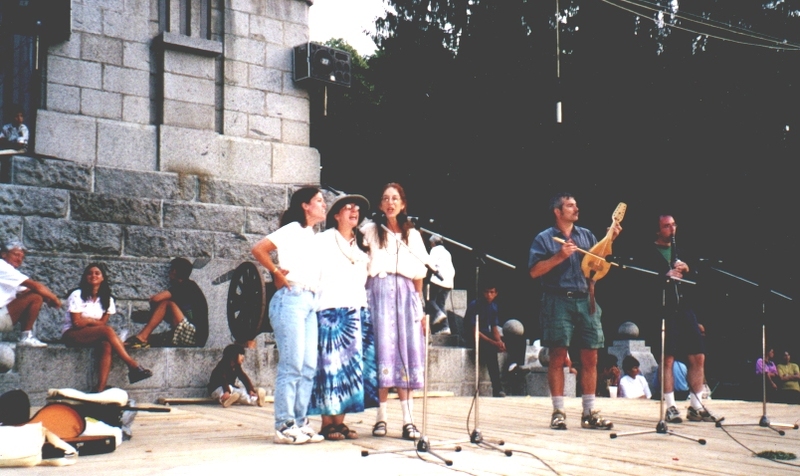 In August of 2000, five of Zdravet’s members were together on a tour to Bulgaria. Being together, they quite naturally made music from time to time.... On Sunday, August 13, ZDRAVETS played for dancing in the village square to close down the 2000 Koprivshtitsa Festival in Bulgaria. Click to enlarge. Photo courtesy of Sid Smith. A week later (Saturday, August 19) Zdravets played a short but very enthusiastically received set at the Petrova Niva Festival in Strandzha (south-eastern Bulgaria). On Tuesday, July 18, ZDRAVETS played for the opening dance at the Folk Arts Center’s “Dancing By the Fountain” in Copley Square, Boston. Before that doesn’t count as “recent” anymore...but we did lots & lots of gigs since we formed in 1989.